The views Day, Week and Work Week allows users to create and delete events, move them in drag & drop mode to required position (time). Month view allows users to create, move and delete events. Year view allows to view, edit, and create events. 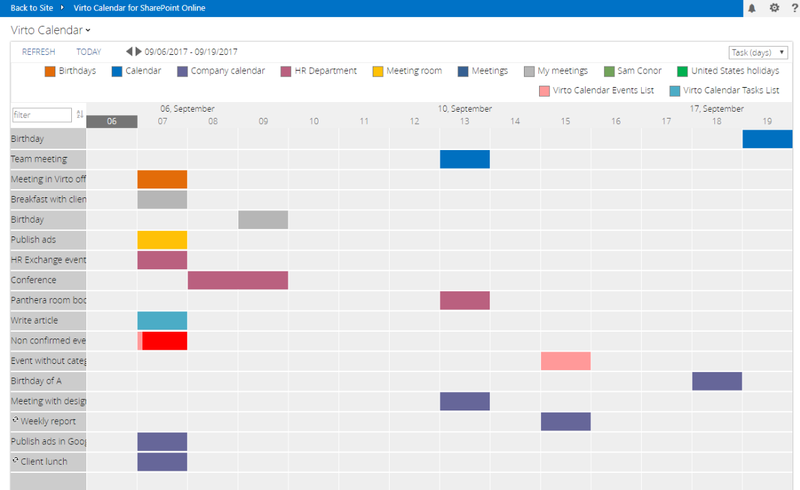 Gantt View in the Virto calendar is provided in two views: Task (Days) and Task (Hours). These views allow to display items grouped by events and see which time exactly planned for them. Users can create, delete, and move events. You can apply a filter to find events from events list and use the sorting in the alphabetical order. Second click on the AZ filter allows you to apply the reverse order (Z>A) to the events list. This example shows the applied text field filter "meet" and events sorting in A>Z order (the applied AZ filter icon is highlighted with red). Note: since any field on Integer type can be set as field for completion show, the percentage will not be displayed in case the value of the field is higher than 100%. Multi Source View allows users to view events planned for a day but all the events will be grouped by source. Here you can resize or edit events. But you cannot move events from one source to another.